Orient Express is pleased to offer a precision crafted manually adjustable cam chain tensioner. CNC machined billet aluminum bodies are engineered to fit the stock openings precisely, and are anodized black for great looks and corrosion resistance. 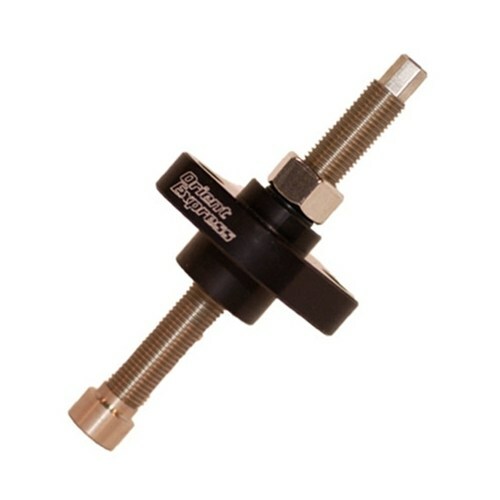 Billet stainless steel adjusting shafts are fine threaded for perfect adjustments on your high performance motor, and feature a hexagonal machined end that is easy to put a wrench or socket onto in tight spaces under the tank. All Orient Express adjustable cam chain tensioners include the replacement gasket or seal for easy installation. Your tensioner may vary in appearance and size.